Halloween is almost upon us! Tis the season of ghosts and goblins and candy! This was the inspiration for this month’s Clandestine Cake Club. Having recently taken over the organisation of the Reading group I was happy that a few old faces showed up! Just because I love Halloween doesn't mean everyone else does so I made the theme Halloween/Bonfire Night/Autumn. I stuck with Halloween, because as I mentioned I love it. A red velvet cake seemed approiate. The only question was how to decorate it? After the debate vampire or ghost I went with a mummy. Not a mother mummy, but an ancient Egyptian dead one. 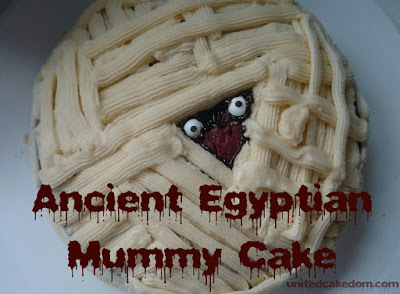 Also the reason I went with a mummy as it was going to be super easy. I’ve said it before and I’ll say it again I’m no cake decorator so keeping it easy is how I roll. Took out my piping bag and had a look through my nozzles took the one that looked most flat like and used it to pipe bandages across the cake in all different directions. Please don’t ask me which nozzle I used because I couldn’t tell you! I can tell you that I used a tried and tested over and over again red velvet cupcake recipe. Straight from the original the hummingbird bakery cookbook. It’s one of those books that’s super reliable and would recommend to anyone. This cake is great for any Halloween celebration! Or a monster movie marathon! Heat the oven to 170°C before buttering a 7 inch round cake pan and leaving to the side. Beat the butter and sugar together until light and fluffy. Add the egg and beat until it’s fully mixed in. Add the cocoa powder, gel color, and vanilla extract and give it another good mix. First add half of the buttermilk, mix until just combined then add half the flour mixing, again until just combined. Repeat adding the remaining buttermilk, then mix. Add the last of the flour and mix. Add the salt, bicarb, and vinegar and beat until well mixed. Scrap down the sides of the bowl into the prepared cake pan and place in the preheated oven for 35-40 minutes. Cake sound spring back when gently pressed and skewer test should come out clean. Leave to cool for a few minutes before removing from the tin and leaving to cool completely before icing. Beat the icing sugar and butter together first before adding 1 tablespoon of milk and the vanilla extract. If it’s too thick then add the other tablespoon of milk, if it’s too soft add more icing sugar until you get the consistency you need to be able to pipe it. Fill the piping bag that has a flat like nozzle with the frosting and pipe a triangle in the middle of the cake wherever you want. Then continue to pipe “bandages” everywhere but inside the triangle. 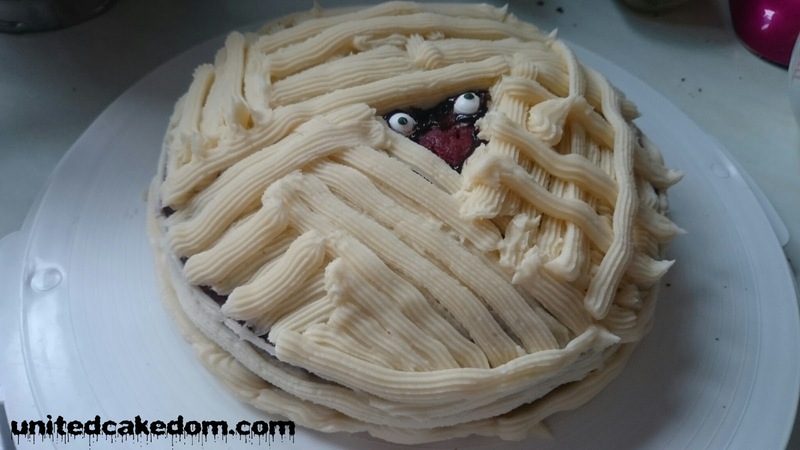 Add too googly eyes by adding a dot of frosting to the backs of each and stick on the cake left bare. Or you could pipe your eyes on. Whatever suits your skill level! We met up at the amazing Alto Lounge in Caversham, just outside Reading town centre. It has a homey atmosphere that was perfect for out gathering and the staff were super friendly!